Super excited to post my first project as a member of the Scraps of Color (SOC) Creative Team. Check out the SOC blog by clicking ====> HERE!!. 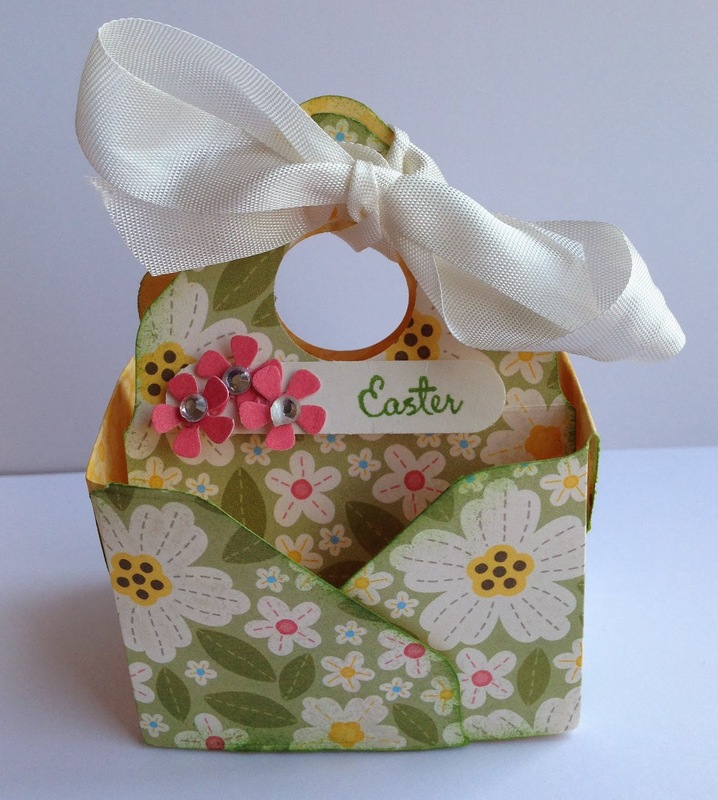 I am thinking spring and the Bag In The Box using patterned paper with a springy feel does it for me, how about you? Here is video tutorial so you can follow along and make one too!! 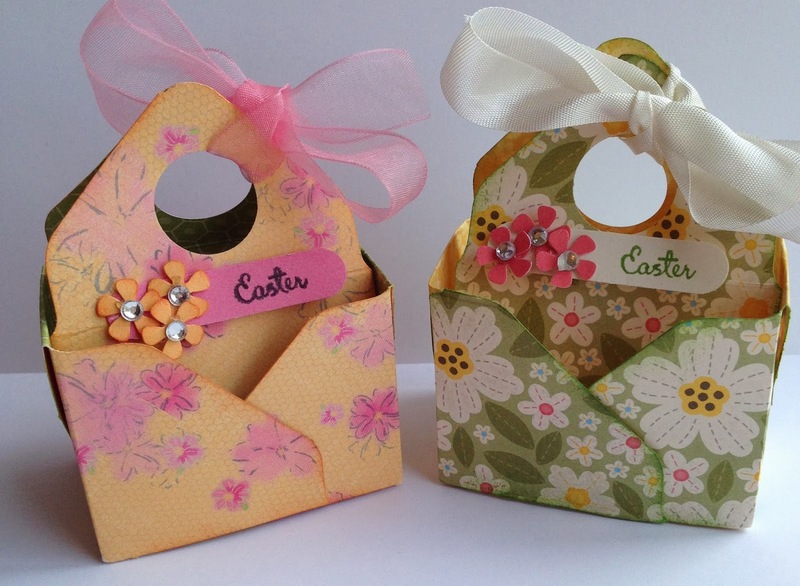 You will need an envelope punch board and a 6 x 6 piece of card stock. 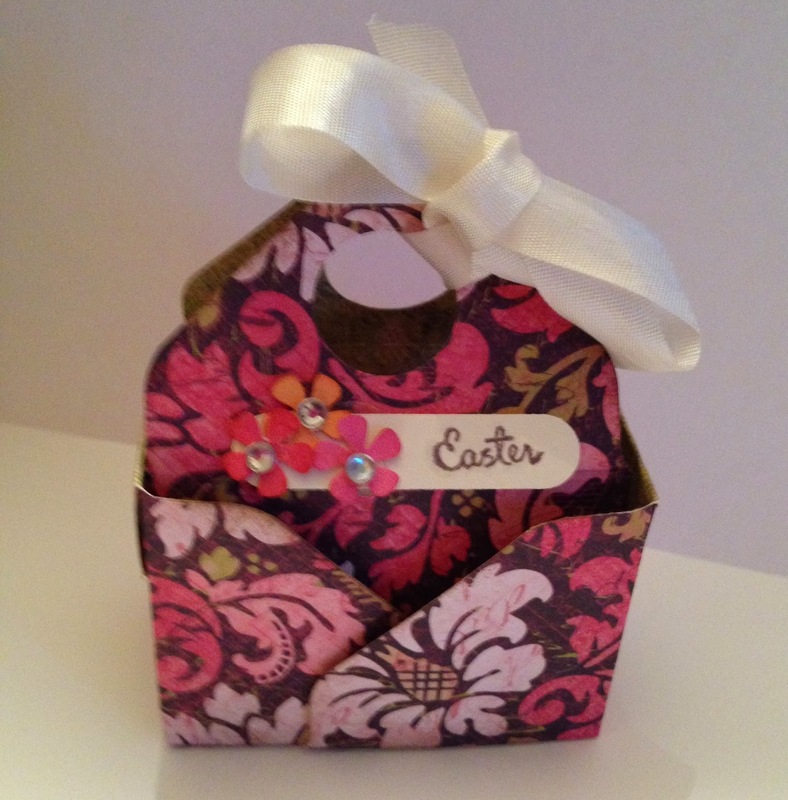 I used a piece of patterned paper which has a pattern on both sides to give it some versatility. 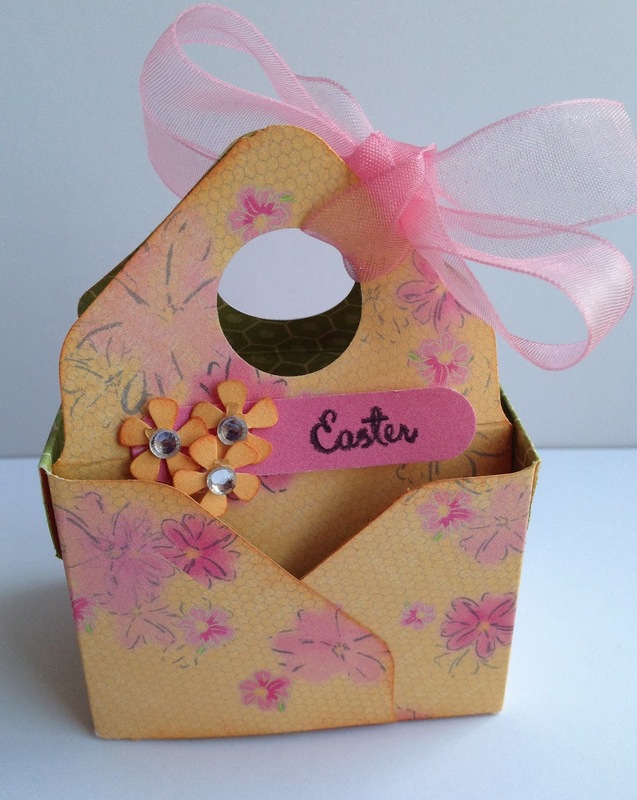 Place the piece of card stock on your punch board and punch at 1 3/8 and 4 inches scoring at each punch. You will want to punch the remaining 3 sides using the score line as your marker to punch. Then use the corner rounder to round the 4 corners. Crease the paper on the score lines. You will have 2 small triangles and 2 larger. On the larger triangle side cut in to the first score line. It will be a total of 4 cuts. Put adhesive on the 2 smaller triangles as show above and fold them back. These flaps will be visible on the outside. Cut out your handle. Above I used a 3/4 inch circle punch. You can be creative and use an oval. I then pulled up the flaps to create the box, lining up the edges and securing with a glue dot. Do this on all 4 sides and now you have your Bag In A Box! Add a piece of ribbon to finish it up. The possibilities are endless. 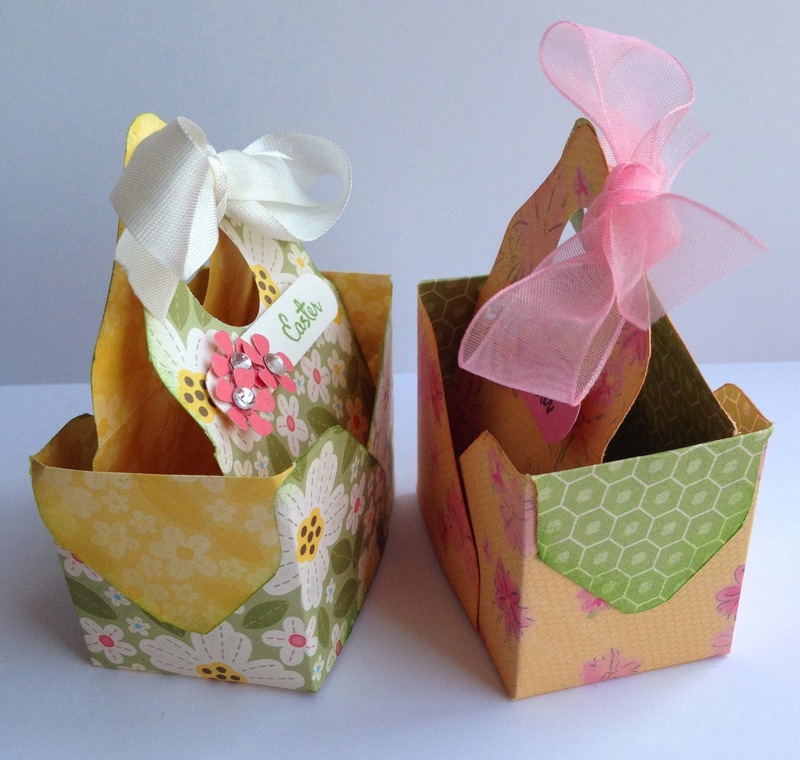 From one 12 x 12 pieces of paper you can make 4 Bag in a Boxes!! These are great gifts for just about any holiday with the right patterned paper. For Easter the small plastic eggs fits perfect!! I hope you are inspired by this tutorial!! Now I challenge you to create one and post the link in the comments! !